If you’re in a tough line of work, you need a pair of indestructible work boots that will offer you the much-needed protection. Won’t that mean sacrificing your comfort? Not a chance; these boots are really like Iron Man: toughness and comfort combined. The days when work boots were tough, yet hard as bricks are long gone. Now, you can benefit from a cushiony experience, provided you choose your poison right. 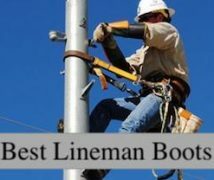 As such, we’re here to help you with some great tips on how to choose the best work boots for your line of work. But before we do that, if you’re in a hurry, here is a table with the products we’ll analyze today. Further down you can read each individual work boot review. Further down you’ll find more info in regards to what each of these mean. You don’t just need protection against impacts, compression, and electrical hazards. You should also think about general things like weather protection and waterproofing levels. As such, consider how padded the boots are. The more padding you add, the more insulating and cold-proof they’ll be. On the other hand, they might prove really uncomfortable in very warm weather. Some work environments might require additional protection against acid or chemicals, so check that the boots you choose can offer you that. If you’re constantly working in rainy weather or outdoors, you might also want a pair of waterproof boots. In this case, make sure that everything about them is waterproof, from the welt to the lining and the grommets. Besides, especially in this case, you also want a slip-resistant sole. There are a few things to take into account here, like the welt or the closing system. You can choose cement welting, which is very flexible but can’t withstand rugged work environments. The Goodyear welt is the most resistant, waterproof and easy to repair, though not so flexible, while the middle choice is the Blake welting. You can also choose between laces or the pull-on system. While laces have the advantage of an adjustable fit, they also take longer to tie. From that perspective, pull-on boots are a weird combination of boots and slippers. If you want an aggressive pair of boots, make sure you check the tread. Lug outsoles with square heels and high platforms are great for tough work conditions. And if you’re interested in comfort for prolonged hours standing, you should choose an ergonomic pair of boots, with anatomic designs and asymmetrical toes. Most work boots feature some sort of leather for their uppers. While full-grain leather is more resistant to punctures and water, Nubuck leather looks cooler and it also weighs less. Of course, the combination between leather and textile weighs the least, but this is also the least resistant option. In terms of outsole material, rubber and polyurethane are the most common choices. Rubber is heavier and sturdier, but polyurethane is lighter and offers increased traction. Besides, make sure you choose a pair of boots with extra cushion on the midsoles and insoles if comfort is your top priority. However, these materials add to the total weight, as well as to the overall warmth, so take that into account as well. Each of these brands come with a lot of tradition. They are highly reputable and trustworthy companies with a lot of loyal customers. So although each manufactures boots for different purposes and different price ranges, they all have their particularities. For instance, Thorogood is renowned for a tough build, Timberland for enhanced cushioning, CAT for their durability and Keen offers some nice metatomical designs. Below you’ll find some of the top boots for work. Because there’s no such thing as a perfect pair, we’ll analyze all these boots in terms of their pros and cons, so you can make valid comparisons and an informed choice. Now, without further ado, let’s get to the reviews, which are divided into the type protection they offer. The steel toe cap is the most resistant of the batch, providing valuable protection against impacts from falling objects, compression or any sort of obstacles, along with possible cuts. Valued for its extreme durability and found in combination with midsole plates that protect your soles from punctures, steel toe boots meet certain ANSI/ASTM requirements. 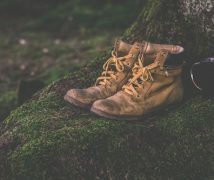 One of the reasons is that steel toe reinforcements are the only ones that bend when they’re exposed to increased pressure, instead of shattering inside your boots. Still, you’d best not wear them if you’re exposed to electrical hazards, not unless your boots have a specified EH resistance. The Thorogood boots are in the mid-price range thanks to their enviable construction which shows a durable USA manufacturing. The materials used are top notch, but so is the overall craftsmanship, and the final result is a stylish pair of boots that meet the ASTM F2413-11 M I/75/C/75 ratings. 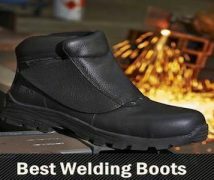 These are also EH-resistant to 18,000 volts at 60 Hz for 1 minute, which is indeed a valuable extra for steel toe boots. The leather used for the uppers is very comfortable and resistant to punctures, while the polyurethane MAXwear wedge sole is great in terms of traction. With 6.5-inch shafts and fiberglass shanks, your ankles will have all the support they need. I like the cotton drill vamp lining because it’s very resistant, just like the Goodyear storm welt. And even if Goodyear welts are said not to be that flexible, the Thorogood Boots actually are. However, it will take you a while to break them in. When it comes to comfort, these boots minimize foot fatigue thanks to the comfortable Ultimate Shock Absorption footbeds, which can be removed if you want to, as well as Poron insoles. Still, the arch support is mediocre at best, so you might want your own insoles if you have high arches. These KEEN boots are great for medium-duty construction work. That’s because they are equipped with steel toes that are resistant to impacts and compressions, but the Nubuck leather used for the uppers is less resistant than full-grain one when it comes to punctures and scratches. Still, these boots are amazing for warmer weather, and they feature the Dry-Lex footwear lining to wick moisture, so your feet can remain dry for prolonged periods of time. The rubber soles provide great traction, so these boots are resistant to oily and slippery grounds. The feature I like the most is their ergonomic design. You can see that reflected in the contour heel lock that’s incredibly comfortable, reducing foot fatigue, the asymmetrical toe protection, as well as in the metatomical EVA footbed which bears the KEEN signature mark. From my experience, they are ideal for concrete floors and standing all day. These Thorogoods are another example of some of the best steel toe cap boots for men on the market, just like the previous pair we reviewed here. And just like it, the Thorogood durable, made in the USA construction is extremely visible here, rendering another ASTM F 2413-05 M/I/75/C/75 rated, EH-resistant pair of boots. With their full-grain leather upper you can rest assured these boots will protect your feet from rain as well as possible scratches and/or punctures from debris. The dual-density PU outsole is amazing for providing an awesome traction on slippery ground, while the 90-degree heel is just what you’re looking for to reduce foot fatigue. Speaking of which, we love to see the same combination of the Ultimate Shock Absorption footbeds and the Poron insoles that are so comfortable. Besides, the fiberglass shank and the 6.25-inch shaft will provide the much-needed support to your ankle, while the Goodyear storm welt will last for years, even with aggressive use. On the other hand, the shoelaces tend to slip, and the arch support isn’t that great. You might also notice that the toe box is rather small, which is quite common for steel toe boots. These Caterpillar Second Shift are another good pair of work boots, albeit they come at a reduced price when compared to some of the previous work boots we reviewed here. That’s probably because, although they are rated ANSI Class 75 against impacts and compression, they’re only resistant to electrical hazards up to 600 Volts in dry conditions. Still, that’s a pretty good feat for steel-toe boots. Their Nubuck leather uppers are good enough, although not extremely durable or resistant to scratches. We love their nylon mesh Climasphere lining, though, that’s great for wicking moisture and leaving your feet feeling dry even in warm weather. I like the rubber soles too, they’re great for offering good traction and they’re oil-resistant. The plush collar and tongue are really comfortable, especially if you wear thin socks, and the speed lacing is pretty sweet. Still, these boots are a bit on the heavy side, though that’s nothing most construction workers aren’t used to. They also have a rather small toe box, so they might run narrow on your feet, in which case you can always return them and order another pair that fits better. If you love the protection offered by steel toes but would still prefer something lighter, then alloy toe reinforcement is a great choice. That’s because it’s made of materials like Aluminum, Titanium, or Kevlar, which are really light and sturdy. 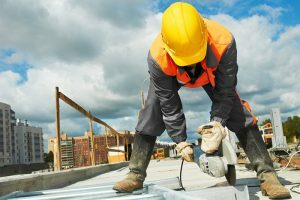 So if you don’t want to drag your feet around your work site, if you’re constantly walking or climbing stairs, it’s best to avoid feet fatigue. Still, considering alloy reinforcements have some metal in them, you’d also better avoid electrical or static environments unless the boots are marked for electrical hazard protection. These Timberland boots feature an alloy, titanium-based toe with some great features, starting with their ASTM F2413-05 M I/75 C/75 Electrical Hazard rating, that’s on par with many steel-capped toe boots ratings. However, these are far more comfortable and light, very appropriate for heavy industrial environments. Their full-grain leather upper looks well and is resistant to scratches and punctures, but the rubber sole, albeit slip-resistant, isn’t that durable. The 7-inch shaft provides great ankle support, though the laces are somewhat short, so you might need to get another pair of laces if you don’t like the tight fit. The heel and platform are high enough so you won’t feel debris under your feet, they’re also really great for working from puddles, but the 10-inch boot opening could be somewhat larger. I love the anti-microbial, spacer mesh lining, though, it’s really great not to have smelly feet after a hard day’s work. Besides, the polyurethane midsole, the Outlast Adaptive Comfort footbed, and the Powerfit™ Comfort System all bear the Timberland signature in terms of comfort. I also like the nylon diffusion shank that’s particularly supportive. These Timberlands are another great pair for standing on concrete. Their Titan alloy safety toe offers a medium protection against impacts and compressions, and these boots only have the ASTM F2412-05 and ASTM F2413-05 Electrical Hazard ratings. On the other hand, they’re very light and otherwise weatherproof, with a full-grain leather upper and non-slip rubber sole. They have a sturdy build, with a supportive 6-inch shaft and a 6-inch heel, with moisture-wicking and anti-microbial mesh lining. I like how user-friendly these boots are, thanks to their speed lacing and high-rebound heel insert. Add the polyurethane midsole and the contoured open-cell polyurethane footbed and you have some really cushiony boots. Still, the arch support could be improved. Besides, don’t forget about the trademarked Outlast™ Adaptive Comfort ™ and Powerfit™ Comfort System, which help win these boots first prize for comfort. I also like the nylon diffusion shank in terms of support, although the laces offer a really tight fit so there might be something like too much support. Manufactured in the USA, these Danners are another top-rated pair of boots. You can see that reflected in their high retail price, these are in the same range as the Thorogood Men’s American Heritage. With a full-grain leather upper, they can resist various punctures. Plus, their 9-inch shaft provides great ankle support although you might find they have a narrow fit. And since they boast a higher shaft than the Thorogoods, they’re less exposed to debris or water getting inside them. I like how comfortable the Gore-Tex liner makes your feet feel, and the whole handcrafted stitch-down construction shows where your money’s going to. I also like their Wedge sole that’s resistant to slips, although the arch support provided is minimal – just like the Thorogood boots before them. With a 1.25-inch heel and 0.75-inch platform, you can work even on rolling terrain without feeling it. Their alloy toe isn’t as protective as a steel toe, but it still offers some reliable electrical shock protection. If you’re sick of metal’s electrical conductivity and want something more protective in environments with electrical hazards, composite safety toes are here to the rescue. Made of materials like fiberglass, carbon or kevlar, these toes show a remarkable decrease in weight and offer decent protection complying with the ANSI requirements. Basically, if you’re at risk for electrocution or work in places with metal detectors, composite toe caps are great. Besides, since they weigh half as much as steel toe caps, they’re really comfortable for prolonged hours standing or walking. They’re also great for a vast temperature range since they also don’t conduct heat, but remember that they’re not as protective as steel toe caps. So although composite toes can offer some protection against impacts and obstacles, they’re not that amazing against compression hazards or cutting chainsaws gone haywire. These Carhartt boots are ideal for men that work in environments prone to electrical hazards. With their composite toe that’s mildly protective against less vigorous impacts, they’re also ASTM 2413-11 EH rated. Besides, they’re resistant to oil, slips, as well as chemicals, which wins them a lot of points on the versatility scale. I like that, although these boots are in the affordable price range, they have a pretty sturdy, reliable construction. Their brown oil-tanned leather uppers are puncture and water-resistant, while the rubber soles provide good traction. These boots are light, crafted with the Rugged Flex technology that entails adding multiple polyurethane layers beneath the insoles for maximum cushioning. The string tie boot laces are very secure, just like the 6-inch shaft that provides optimal ankle support. However, the cement welt construction isn’t that great for rugged environments, nor for extended use, although it’s really flexible and it’s among the best for walking on concrete. Still, remember that these boots aren’t for a very cold weather either, and they’re also not waterproof. Although these Timberland boots are a bit more expensive, you can immediately see why they’re very popular among others. With their leather and textile uppers, these boots are resistant and look amazing. Their Anti-Fatigue Technology is a plus if you’re standing for prolonged periods of time, and combined with their composite toe, these characteristics render them perfect both for construction work and hunting. Besides, the rubber soles are slip-resistant, while the 8-inch shafts provide terrific ankle support. These Timberlands are also waterproof. Of course, they also feature a waterproof membrane that’s moisture-wicking and antimicrobial treated, so no smelly feet for you. However, these boots aren’t particularly insulating, so they’re not extraordinary for cold weather. The dual-purpose top hardware makes for a speedy lacing job, while the fiberglass shank and padded collar are supportive, yet comfortable at the same time. I also appreciate the user-friendly rubber molded toe protection on the exterior, which is great against impacts, enhancing the performance of the composite toe. 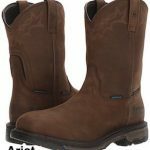 The Ariat boots are among the best slip-on work boots out there, with features that really make them great for working, besides others, in rainy weather. Their full-grain leather uppers are super resistant and comfortable, and their 10-inch shafts offer some good ankle support. However, they do require some time to break in. With a Waterproof Pro design and a mesh lining that makes them breathable and moisture-wicking, you’d be surprised that one of the things I love most about these boots is their soles. That’s because although they have a common rubber construction, they offer a self-cleaning, non-tracking tread. I also appreciate the resistant Goodyear welt and their stability chassis, as well as the fact that they’re quick to put on. However, although they feature a composite toe, they can get dinged easily enough. Besides, the toe box is somewhat wide, so they might run a bit large. The challenger here is the soft toe reinforcement, which, although offers no protection against any sorts of impacts or compression, it’s great for a work environment with no falling hazards or other major risks. So if you have a desk job or simply have to be on your feet for hours at a time, safety toe caps are the lightest and most flexible – usually resulting in the most comfortable boots. They might also have some degree of resistance against oily, slippery surfaces, against chemical or electrical hazards, which is great for electricians or people dealing with live cables. Props to Chippewa for manufacturing some lightweight work boots for men in the category of affordable, soft toe boots. The full-grain Apache leather uppers are resistant and they look great, although they can become less professional looking with extended wear. With Vibram soles, these are very light and cushiony, while offering a great traction. With a 5.75-inch shaft for good ankle support, the D-ring lacing is only the icing on the cake. Besides, you get an American Flag lace pin on the laces, which should make you proud! These great boots are also made in the USA. The brown uppers and the contrast midsole render a stylish-looking pair of boots, that are quite comfortable. Besides, the Goodyear leather welt is resistant and can be resown, but remember that these aren’t boots made for tough on-field conditions. If you’re looking for a pair of cheap work boots, these are great for the job and in the same price range with the Caterpillar Men’s Second Shift. They have a soft toe, which makes them non-safety and less resistant than the Caterpillar’s steel toe, however. Still, they have a durable, waterproof construction to tackle inclement weather and rugged on-field conditions. For instance, their full-grain leather uppers are very resistant to rain, punctures, and scratches, much more resistant than the Caterpillar’s uppers. While the rubber soles are great in terms of traction, these boots are a bit on the heavy side, even with the soft toe and all. Plus, they might run a bit wide. However, you can appreciate their good ankle support courtesy of a 6-inch shaft, as well as their lightly cushioned footbed. So even if they’re not the most comfortable around, they’re affordable and extremely durable. 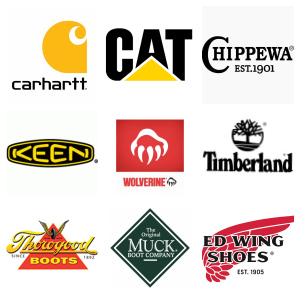 I’ve taken you through a series of some of the best-reviewed work boots, so I hope you found something you like. All these boots have some unique features and there’s one for every price range. Which boots do you like most? Have you already tried one of these boots? Which ones would you recommend? Let us know in the comments box below!